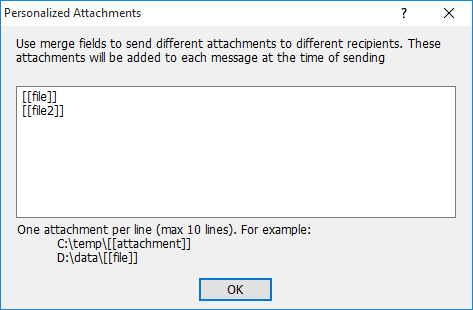 You don't need merge fields if the messages to all recipients are identical. The mail merging feature enables you to personalize the message to each recipient in your mailing list by using merge fields. Merge fields are column names enclosed by [[ and ]]. Yes. To insert a merge field into email Subject or Body, click menu "Insert" -> "Merge Fields" on the Message Composer. Yes. e-Campaign allows you to send personalized attachments (different attachments to different recipients). Suppose you have a mailing list file as follows. 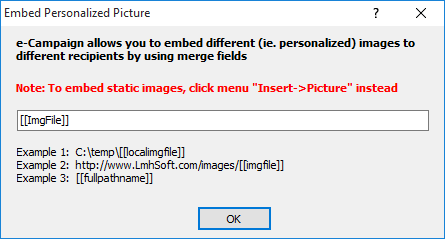 On the Message Composer, click menu "Insert->Personalized Attachments"
On the editbox, enter the merge fields to define the attachment filenames, one attachment per line. In the above example, the merge fields [[file]] and [[file2]] will be replaced with real values in the File and File2 columns, respectively. On the Message Composer, click menu "Insert->Personalized Picture"